The return trip from Chicago also involved airport food, and the breakfast English muffin sandwich was probably the worst airport food I’ve ever had. Muffin not toasted and dry, an overcooked egg, spare overcooked bacon and boring cheese does not make for a satisfying meal for $6.53 with tax. 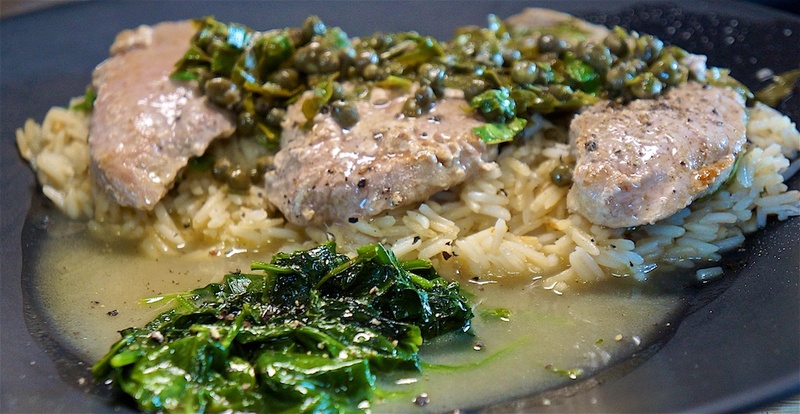 Home again and back to real food, with a pork scallopini piccata based on a chicken version served with buttered spinach and white rice (to soak up all that delicious piccata sauce). Cultured salted butter is $2.99 per 8oz block, and six tablespoons is half the block or 75c per serve. Tonight’s dinner was very tasty, particularly because of the piccata sauce, and cost $8.60 per serve.